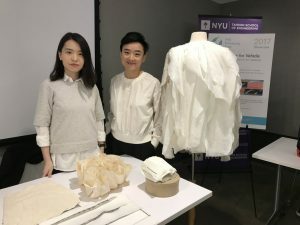 On Tuesday 25 April, the Event Space at NYU Tandon MakerSpace was vibrant with teams of students presenting their prototypes and answering questions from a crowd of faculty, staff, and students. It was exciting to see all the teams from the Prototyping Fund (a collaboration between the Greenhouse Program at NYU Tandon MakerSpace and the NYU Entrepreneurial Institute) come and share the prototypes they developed during the semester and most importantly, the feedback they collected and the learnings they developed. This semester, the Showcase included a total of 21 teams combining undergraduate and graduate students from 8 schools – CAS, Gallatin, Tandon, Tisch, Steinhardt, Stern and Wagner. The projects covered a broad range of fields (health, climate change, food, design, etc.) and were at different levels of completion (even within Phase 1) as the spirit of the Prototyping Fund is to provide students with support to experiment with their ideas, and test whether they work and/or solve a real-world problem or solve users’ needs. 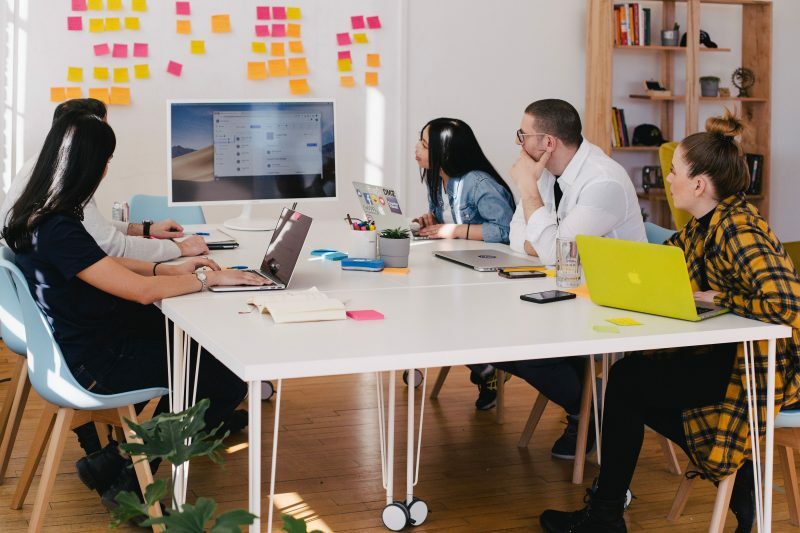 The hope is that whether students realize that their ideas have legs or not, they will have become more confident innovators ready to refine their idea or embark on a new project. 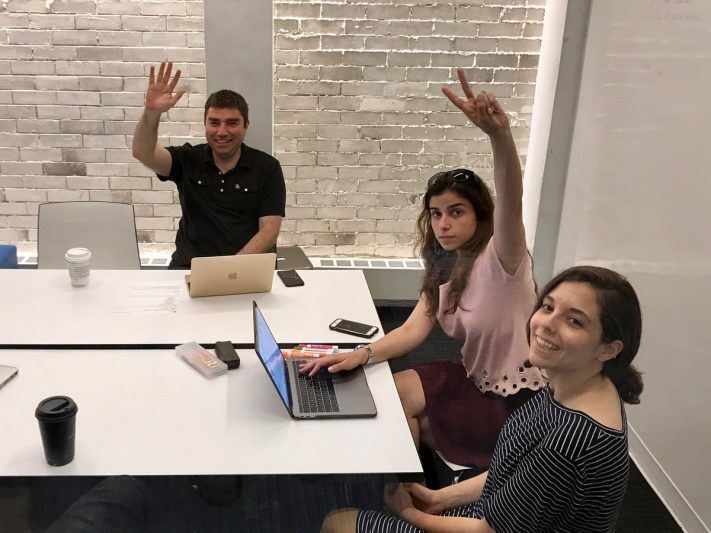 The teams from the Prototyping Fund Phase 1 were all excited to present their prototypes and receive feedback from the NYU community during the Showcase. Participants all highlighted how building a prototype helped them answer questions they had when they started their project, as well as unveil new questions that they are excited to explore. This Spring, our team prototyped a phase 2 for the Prototyping Fund Showcase as we wanted to explore how we could further support students’ ideas. We had the chance to receive the support of a VentureWell grant from the Department of Technology Management and Innovation at NYU Tandon. From the Prototyping Fund of Fall 2016, eight teams were selected and received up to $2,000 to iterate their prototypes based on the learnings from the fall. They were also provided with coaching from our team (Bertha Jimenez and Sarah Maibach regularly met with the team) and from the Blackstone coaches. Students who participated in this phase all highlighted how Phase 2 pushed them to further refine their idea. While funding was important, they all stressed how the regular check ups and the Blackstone mentoring was crucial in pushing them to articulate their ideas and reflect on their goals. Several participants also mentioned the importance of having the time to experiment and test. 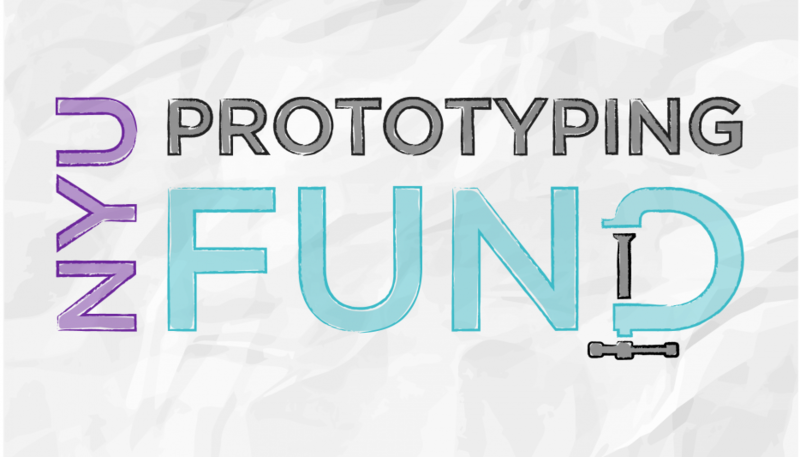 There are many great learnings that will impact how we plan for the Fall Prototyping Fund. 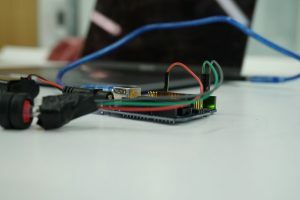 One thing is definite, as we looked at the progress of the awardees of Phase 2 and the great prototypes and insights from the awardees of Phase 1, there is value in providing space, time and resources for students to experiment and play with their ideas. Good luck to all the teams with the next steps of their projects! And of course, good luck with your final exams and projects! Congratulations to those graduating! CoCo Compra Conmigo: A platform that enables members of low income communities to purchase supplies in bulk at wholesale prices. Andrea Davila, Wagner '18; Maria Monica Salazar, Wagner '17; Daniela Sarzosa, Wagner '17; and Carlos Bautista, Tandon ‘16. Confluent: A digital platform that gamifies foreign vocabulary learning by injecting into everyday reading. Jonathin Chin, Steinhardt ‘19 and Christopher Jarvis, Tisch ‘11. DigiTape: An upgrade to your measuring tape: DigiTape can measure curved surfaces and compile them into 2D images. Eroding, Preserving Tradition: Traditional east asian tea cups created with advanced design and manufacturing techniques. Chester Dols, Tisch '18; and Kenzo Nakamura, Tisch '18. Heat Deflector for Vehicle: A mat that deflects heat from the sun to keep cars at a normal temperature. Fei Chen, Tandon'19; Yi Yang, Tandon '19; Xianbo Xu, Tandon '17; and Ashish Singh, Tandon ‘19. Project Reefstone: A data-generative garment that visualizes the dramatic change of global temperature. Hellyn Teng, Tisch '15; Jingwen Zhu, Tisch ‘16; and Yuchen Zhang, Parsons ‘15. Puzzlegram: Musical kit that allows people in elderly homes to experience music making collaboratively. Sunny Choi, Steinhardt '17 and Kate Stone, Steinhardt, faculty. Mobility Devices for the Elderly: An all-terrain adjustable cane and a safe shopping cart. Rodney Lobo, Tandon '17; Eunha (Grace) Park, Tandon '19; Cesar Sindoni, Tandon '19; Dawn Marta Feldthouse, Rory Meyers College of Nursing ‘17; and Sepehr Forouzan Yazdani, Tandon ‘19. Mudguard: A plastic pin with a small plate to be attached to boot and serve as a mudguard. Halim Kerim Bas, Tandon '19; and Rakesh Behera, Tandon. Next Generation Emergency System: A system designed to maximize rescue operation effectiveness to save lives and reduce casualties. Chetan Hasabnis, Tisch '18; Koji Kanao, Tisch '18; Nitish Wakalkar, Tisch '18, Or Fleisher; and Anastasis Germanidis, Tisch ‘18. S.S. Columbia: full sTEAM ahead: An educational game designed to promote teamwork and collaboration among upper elementary and middle school students. Elana Blinder, CAS '17; Tianyi Chen, Tandon '16; Tracy Zhao, Tandon; Tanvi Sinha, Tandon ‘17; Peter Arbaugh, Steinhardt ‘16; and Rhonda Lee Davis, Tandon. Strolle: By harnessing the motion of a stroller, Strolle enables users to power their USB devices on the go. Vending Machine: A compact vending machine kit that can be easily assembled and customized for fundraisers and smaller scale sales. Rita Cheng, Tisch '18; Lindsey Daniels, Tisch '18; and Akmyrat Tuyliyev, Tisch'18. Filament Maker: A device that turns recycled plastic bottles and failed 3D printed parts into filament for Desktop FDM 3D printers. Dakota Marin, Tandon ‘19; Roshaun Morris, Tandon ‘19; Xikun Yuan, Tandon ‘19. Humble: Solar charged power banks that secure full function of refugees’ essential devices. Kohtaro Kosugiyama, CAS ‘20; William Lee, Tandon ‘19; and Christina Perry, Gallatin ‘20. INVIP: Wearable voice assistant that provides fast and accurate image recognition to people with blindness or low vision. Nicolas Metallo, Tandon ‘17; Nuvina Padukka, Tandon ‘17; Brenda Truong; Tandon ‘17; Izabel Izquierdo, Columbia University ‘17; and Edson Tapia, University of Barcelona ‘15. Peris: Combating the opioid epidemic with a secure pill bottle that only dispenses the prescribed dose at the prescribed time. Artin Perse, Tandon ‘19; Nabil Abbas, Tandon ‘17; Alyssa Liu, Stern ‘17; and Forrest Denton, NYU Shanghai ‘18. Resprana: A wearable filter for the nose and mouth that utilizes the efficiency of existing filters, but is smaller and more comfortable. Micah Steiger, Stern '18, Jai Rathore, Tandon ‘17; Sophie Frank, Stern ‘17; Sukanya Goswami, Tandon ‘16; and Andrea McDonald, Stern 17. TECHnically Speaking: Communication and room control device for ventilator dependent patients in pediatric and adult intensive care unit with limited mobility.Mark Arroz, Steinhardt ‘17; Yan Zhao, Tisch ‘17; Adisa Narula, CAS ‘17; Jason Beck, Tisch ‘17 (ITP); and Hsu YiWei, Tandon ‘18. The NYU FREEdge: The world’s first smart food sharing refrigerator, which tracks the kinds of food the community shares and takes. Simon Chen, Tandon ‘18; Emma Hoffman, Gallatin ‘18; Rodney Lobo, Tandon ‘17; Vandit Maheshwari, Tandon ‘18; Michael Niamehr, Tandon ‘19; and Tuba Naziruddin, Tandon ‘18. We are the New Farmers: A mini-farm that tries to find new solutions to the challenges of food production. Omar Gowayed, Tandon ‘21; Jonas Gunther, Tandon ‘18; and Selim Senocak, Tandon ‘18; Will Nodvik, Tandon ‘19.